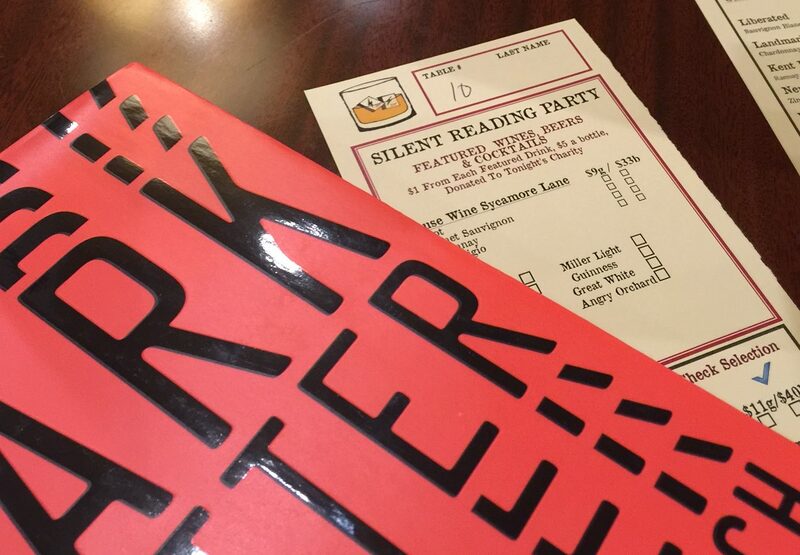 I went to a silent reading party this week, and it was the most fun I’ve had in ages! What’s not to love? 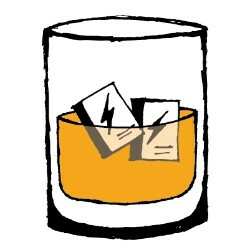 A room full of bookworms (book enthusiasts… book nerds… book freaks… ), drinks all around, silent (but companionable) reading, and raising money for a good cause. I ask you — can you think of a more fun way to spend a Tuesday evening? Drink, eat, and read. Silently. 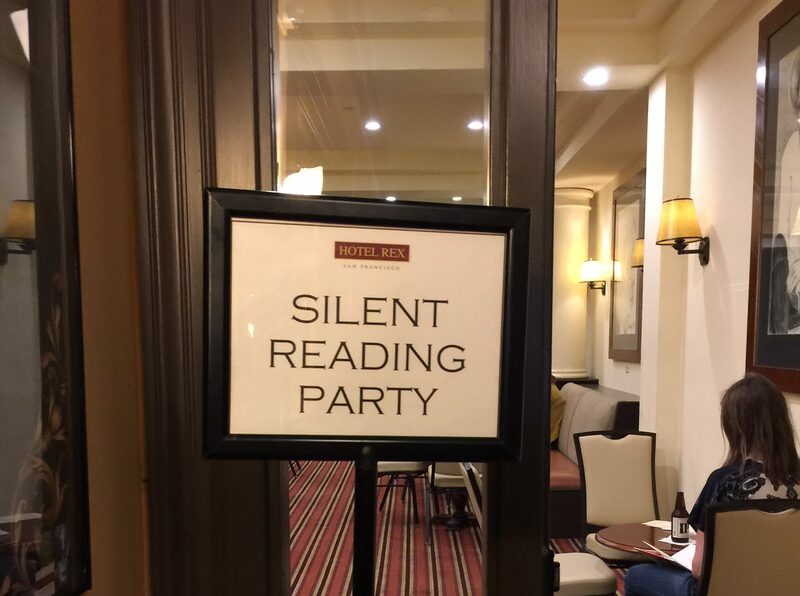 Silent Reading Parties started several months ago here in San Francisco, hosted by Lemony Snicket (Daniel Handler) and Radio Silence. 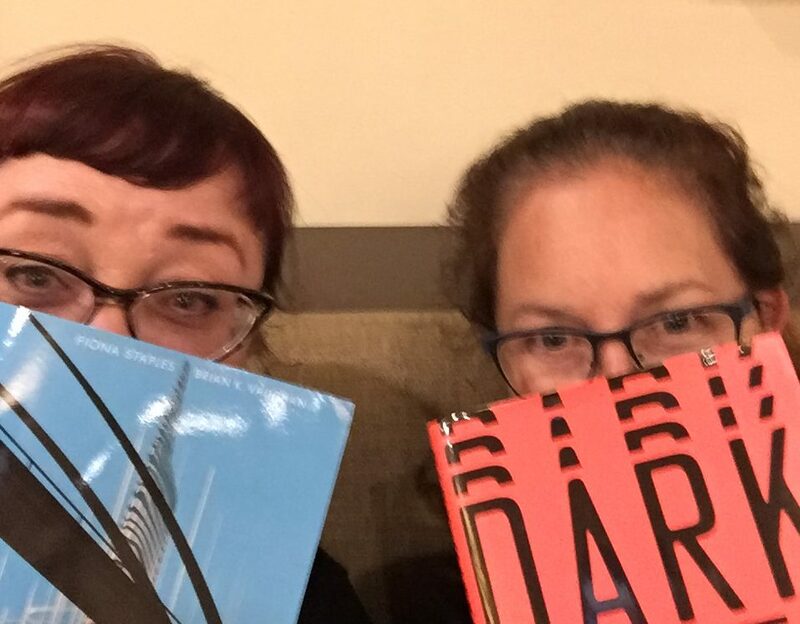 They’re held on the first Tuesday of each month at a downtown hotel — a hotel with a very stylish “library bar”, which feels cozy and bookish as soon as you step inside. Starting at 6 pm, talking stops and reading begins. And the room remains silent. For an hour and a half, there’s light jazz music playing in the background while 40 or so bookish folks sit and read. Seeing how it’s a bar, there are drinks, of course. There are menu cards on the tables, so you can order drinks and munchies without breaking silence. I finished the last few chapters of Dark Matter by Blake Crouch, while my friend read volume six of Saga, then started on the “Weird Junior Edition” of the Worst-Case Scenario Survival Handbook. We read. Drank some wine. Ate some fries. Grooved to the jazzy tunes. And then at 7:30, the silent time was done, and the readers shook themselves out of their trances. Some stayed and schmoozed, some went on their merry ways. And I’d bet that most will be back next month for more. All this wild and crazy fun, and a good cause too! A portion of the drinks proceeds plus the contents of a fishbowl full of cash (which Lemony Snicket personally handed round for contributions) all go to support the library of one of our local public elementary schools. As if I needed any further inducement to sit and read! My son thinks I’m weird, and wonders why I couldn’t have just sat at home by myself with a book instead of going out to read. But he doesn’t get it… and I bet anyone reading this post absolutely does. Booklovers are solitary creatures in their pursuit of great reading — but who says we can’t read alone, together? Consider me hooked… and absolutely looking forward to next month’s (sssssh… no talking!) party. What an amazing idea! 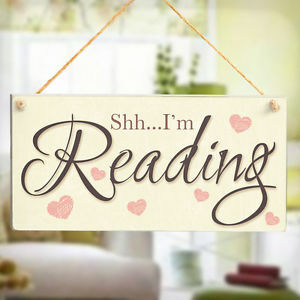 Reading is very often a solitary pastime, but it doesn’t HAVE to be so. I love it!! It was brilliant! My daughter and I plan reading outings all the time, but I never would have thought that reading in a crowd could be so much fun. I can so relate haha. OMG I wish they had this in my town. Such a great idea! OMG that’s amazing!! I am quite jealous! It was so much fun! Maybe try to start one where you live? This sounds like an awesome program for our library. We already host write-ins for NanoWriMo so this would be a great extension of that! This is an awesome concept! Wish there were some around where I live! Yup I would do this. Spread the word matey so that there is one in the next port I find myself in! Perhaps share this post and comments to Lemony Snicket and he could help start some franchises! 🙂 we all want one in our town. This sounds so fantastic! I would totally do this if there was one by me! It’s so much fun! Can’t wait for the next one, in October. What a lovely, lovely idea. It’s funny how companionable it is to sit in silence, sharing an activity – a bit like fishing, without having to be unkind to fish! I see silent reading parties are sweeping America http://bit.ly/2dfPX4B (sweeping slowly, but sweeping) I think I might start one in Brighton. Oh, you should! 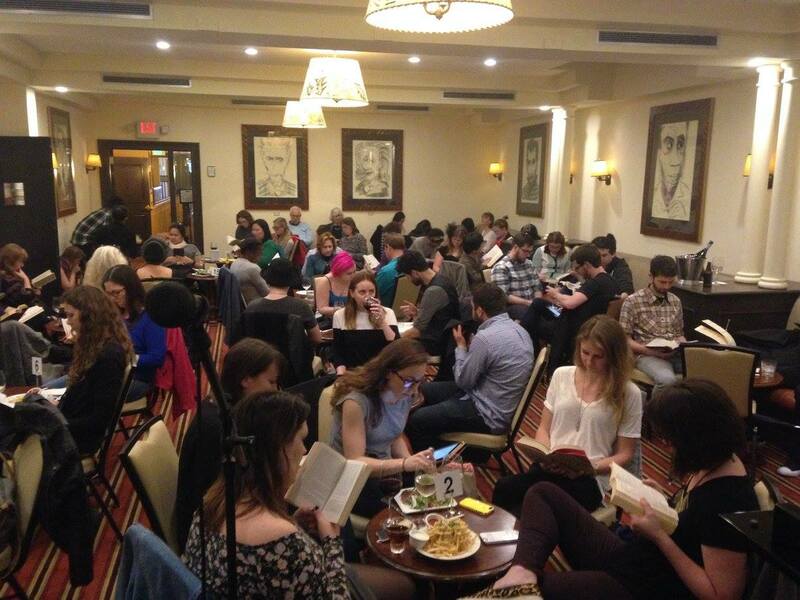 People who aren’t devoted readers don’t really get it, but it really is such a wonderful feeling to sit in a room full of other booklovers and just enjoy, together. It sounds wonderfully companionable. I’m going to scout around town for a likely spot – somewhere comfy and enclosed. I suppose it has to be a bit closed off otherwise customers walking in from the street might think they’ve stumbled on a religious meeting! I’ll let you know how it goes. Sounds like great fun, even though I don’t think my ADD would allow me to completely submerge myself in my book in a room full of people. Oh, it was so much fun! To be honest, the hardest part for me was the jazz music playing in the background. It was pretty, but at home, I don’t play music while I read, so I found it a bit hard to concentrate at the beginning. I would probably like that too. Did anybody laugh out loud while they were reading? Not that I heard, but there sure were a lot of smiles!